RC Battery Weight: 12.3 oz. 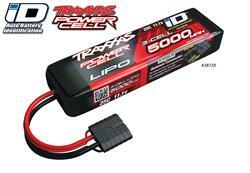 Traxxas Power Cell Lipo batteries punch out the power to reach top speeds in your Traxxas models--fast! These Power Cell Lipo batteries' lithium polymer technology will maximize your Traxxas R/C cars and trucks' performance potential. Available in multiple cell configurations, these batteries feature extra-wide discharge tabs and patent-pending, high-current connectors with a 12-gauge Maxx cable soldered directly to the Lipo cells, ensuring minimal resistance and maximum pack power, run after run. Their semi-rigid wrap and stacked cell construction means no hard case and an easier monitoring of your battery condition, plus the center wire exit offers a perfect, pinch-free fit! The batteries have a integrated balance plug to interface with your Traxxas Lipo charger for equally charged cells and maximum performance. Get the perfect power fit for your Traxxas model to run faster and run longer--power up with Power Cell Lipo batteries.